Alenka, coming from the north of the Czech Republic how come you found your home in Brno, South Moravian region? It started as a professional interest. 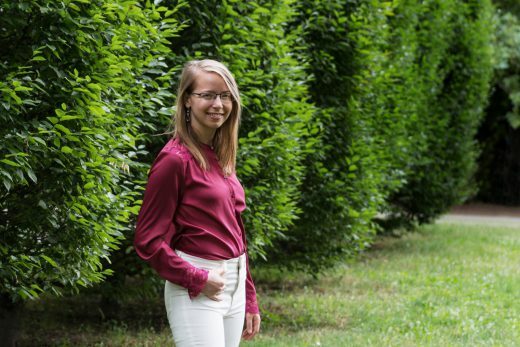 After I graduated from a grammar school in Liberec, I moved to Hradec Králové for 3 years to study foreign languages and tourism at the local university. After that, I followed what I truly enjoyed the most, studying English. What I really wanted was to understand people and English seemed to be the best tool. And, English philology has strong roots in Brno. Why did you choose Brno instead of Prague or other cities? Since when have you been in touch with foreigners in the Czech Republic? I have somehow always magically appeared at the place where they were. When I was a teenager, chatting on the Internet was popular. I used to visit a chat room called “English” which connected Czechs living abroad and foreigners living in the Czech Republic. This is where I learned English, from people. Then, I was meeting many expats as a member of the International Student Club in Brno. And even before that in Hradec Králové. Is it where you heard about Foreigners.cz? Because our co-founders studied in Hradec Králové and started the company there. I first heard about Foreigners.cz from a Czech friend when I was moving from Hradec Králové to Brno. And then I saw the initial job offer on Facebook while I was on my Erasmus stay in Sweden. It was an Office Coordinator position at which I started working in April 2015. I liked it a lot because I learned how to communicate issues and help our clients solve problems, and also how to best help the people in the office. As a student, Alenka spent more than half a year in Sweden. You left this position, though. Yes. I used to be sure I would never work at a business position. Yet, I went for a communication training in January 2016 and soon afterwards, I just woke up with a thought: I want to do it! So I set my own working schedule and started to work as a Relocation Consultant. I tried my best to connect with my clients so they would tell me what they really wanted and needed, and then I knew how best to help them. For me, it also meant stopping the rat race and creating my own life the way I wanted. I burnt out, simply. There was a lot of work in the summer last year and after that, I didn’t want to pull down the whole team with my low results so I decided for a break and left the company. I travelled through 5 countries: Poland, which was similar to the Czech Republic – Sweden, where I felt people still kept a shield around themselves to prevent confronting – Great Britain, where I met some truly posh people – Ireland, where I fell in love with the atmosphere and nature – and Germany, where I met some random people on the train who helped me see the world differently. I started to work even more on self-education, attended courses on personal growth, read many books. I got several job offers but nowhere I felt they would actually see me as a human being just the way I was, and help develop my potential. Basically, there was nothing even similar to Foreigners.cz where colleagues help each other and constantly work on improvement. Your current position is the Executive Assistant. What’s the job about? I like to call myself the invisible support of the entire Foreigners.cz team. I am not actually seen until something goes wrong… And then I am needed fast 🙂 When the system works nobody knows about me. What I do most of the time is freeing the hands of the co-founders from the basic functioning of the company. I also support the team in the non-standard situations when something technical breaks. What do you appreciate on working at this position? Every day, I see a great team helping expats to fulfill their needs. It makes me happy when the team is successful and I do my best to support the team with anything I can. Also, I work directly under our co-founders Andrea and Vojta who are my mentors – as they grow the whole company grows. The way they organize the company is unique because they don’t want a company full of people who just follow them blindly as a herd of sheep but they want capable and communicative professionals who know exactly what they are doing and why. 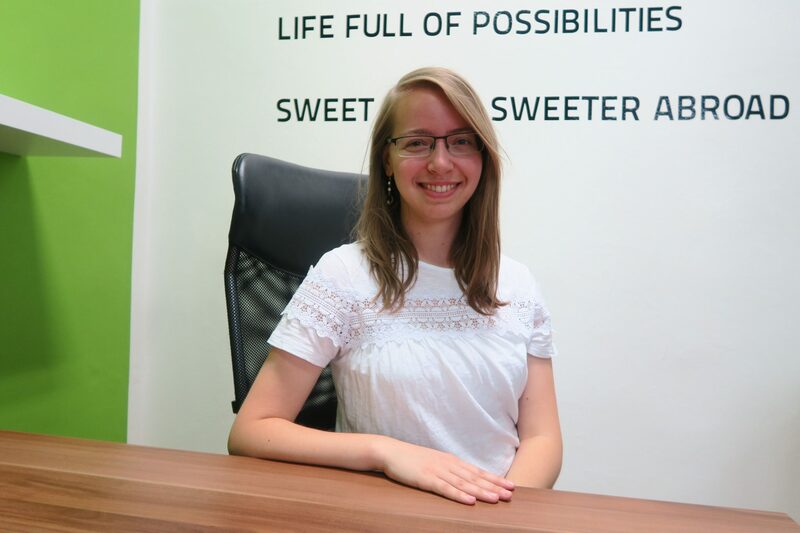 Since May 2017, Alenka has been working as the Executive Assistant in Foreigners.cz. Let’s return to your stay in Sweden. Can you tell us more about it? Yes. I was living there for more than 7 months to work with a technology called eye-tracking to be able to use it in language research. I read a lot and spent a lot of the time in the laboratory so I didn’t get out as much. But I had a great flatmate from Pakistan with whom we went for trips together and who has taught me much about openness and gratitude. When I was making friends in Sweden, I experienced similar feelings people who move to the Czech Republic have. It takes a while to find new people with whom you fit. 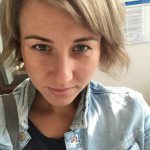 This made me help expats even more when I returned. I am practically surrounded by expats all the time and I enjoy that. I have more friends from foreign countries than the Czech Republic. Was it hard for you to move abroad? What was it like, and how would you compare Sweden with the Czech Republic? I practically moved out of the home when I was 19 years old, but of course, it was challenging for me to then move to another country. I didn’t know the language (even though the Swedish people speak perfect English they still love their native language very much). As I have also said, it took me a while to find my circle of friends. Sweden is a level above the Czech Republic especially in the services, so that is where I want to see the Czech Republic as well one day. Their social system is also very good. Here we normally have to „slave ourselves away“ to reach the middle class. In Sweden, most of the people belong to the middle class with a higher quality of living without having to do anything much, simply as a standard. What surprised you the most there? Swedish people are not used to confronting anything. It is hard to make them angry or make them react in any way. For example, there are homeless people in Sweden. But if you decide to ignore them they are more aggressive than the ones in the Czech Republic. They would clink with the coins in their cups right under your nose. Local people usually give them something since they don’t want to just say “go away”. Needless to say, these homeless are not originally Swedish but come from other countries of the European Union. They are practically outside of the system because they are not registered in Sweden. And then, the government just takes these homeless out of the cities back to their original countries – sends them home especially for winter. Later on, they would just come back in the spring and the circle starts again. So, you returned to Brno. Would you call it an expat friendly city? Indeed! Brno is improving every day. The multinational companies are expanding. More and more people in the stores and offices (at least in the city center) speak English. There are newcomers that create a safe network for others. 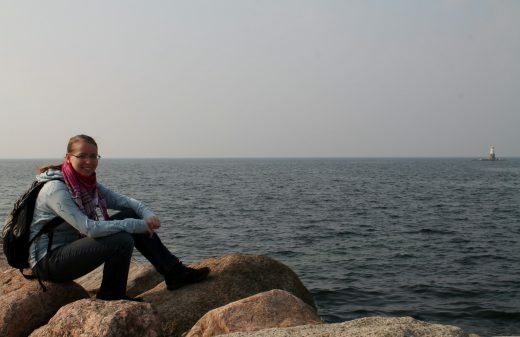 If an expat moves here there is no need to be afraid of being lonely. There are many English friendly groups and communities that support foreigners. Also, Foreigners.cz organizes regular MeetUps where expats meet with both Czech and foreign guests. The city is alive and its mood is very positive. It is way more relaxed than Prague. This city simply has its soul, its genius loci. It’s open and friendly. Call of the Woods is one of English friendly projects in Brno which Alenka has been involved in. You, personally, help expats to integrate not only by working at Foreigners.cz, right? Yes. When I moved to Brno, the first foreigners’ friendly event I visited was a Boardgames event organized by the ISC Brno. I liked it because it created space where people could talk and listen to each other. There I got invited to other events and that is how my network of friends started. Board games became a safe haven for me so later I became an organizer to keep this space alive. Nowadays, I still join pretty often but I no longer organize it. 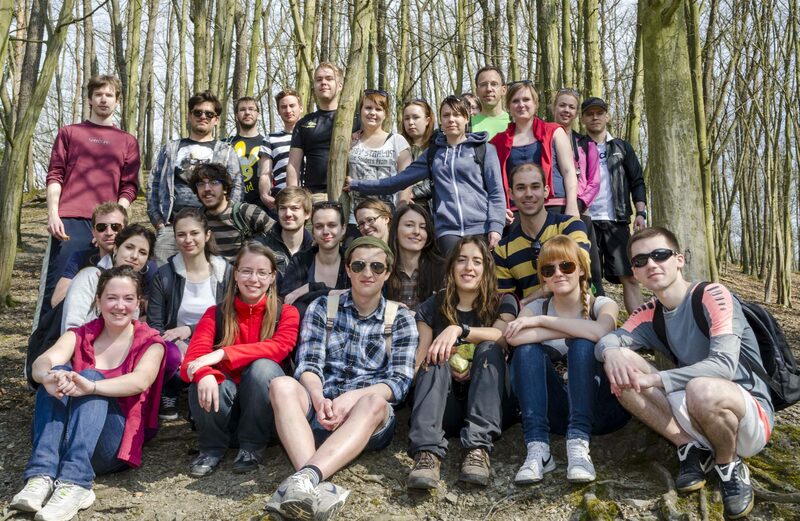 Then, I am behind the Call of the Woods project, going for hikes with foreigners in the woods around Brno. It started by chance, four years ago. Once I wanted to go for a trip and didn’t have anybody to go with me. I wrote to a Facebook group and said: “At this time and place we are meeting for a trip to the Veveří castle”. About 30 people came, and since then we had gone to a new place every other weekend. I used to organize it with my friend who was responsible for the journey planning, timing etc., while I was responsible for the people. And it makes me really happy that we inspired other people with this – such „Calls“ are now organized even behind the Czech borders. Third, recently I also helped to create the Girls Gang Brno, which is a safe space for sharing female energy and supportiveness. We are women from all the parts of this planet but with the same wishes and desires, to belong, to be happy, to be successful, to share, to be safe. We do various activities together – coloring mandalas, walking in the park, picnics, healing circles. We are open and want to help and inspire each other. What are your hobbies besides those mentioned above? I like running. I read – mostly self-development books about personal growth but I like science fiction and fantasy, too. I play a bit of guitar. And I enjoy hand crafts! Each two weeks or so I go to a teahouse. And, above all, I love listening to people, learning their life stories, and seeing people grow. Introductory photo made by Photo Berry. Alenka is a so nice friend to any one who knows her. She is cute, serious and funny, simple and complex (when she needs to be), she is a type of person that you meet once in your life.